By August 1919, the British 45th and 46th Battalions, together with over seven river monitors and gunboats mounting up to 9" guns, over 25 aircraft (mostly DH9A bombers) were in place for the final blow on the Red virus known as Bolshevism. By this time, the French and Americans had all left. It was now a British show and one that was destined to leave a bloody nose upon the Reds. At least that was the plan! 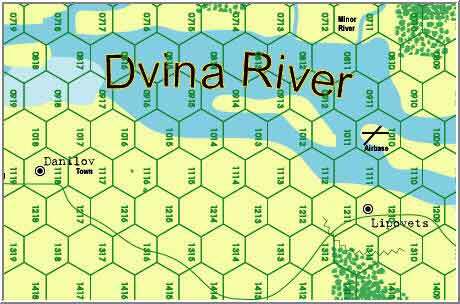 As the troops gathered along both sides of the Dvina River (the river was very large), the opposing forces were as determined. The Reds fielded the 3rd Brigade\18th Division amounting to the 160, 161, 162 Regiments, numerous large artillery barges, six fighter aircraft, many gunboats, lots of mines, trenches. The overconfident British had not factored in the effects of Mother Nature, which as the battle wore on, smiled too often on the Red forces. Clearing BOTH sides of this major river ( think Mississippi) and advancing hundreds of miles to Kotlas (the main Red base) in hindsight, seemed like a crazy idea, but at the time, was a tempting objective. And so it was. 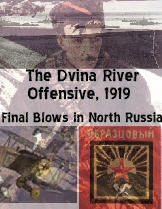 The Dvina River Offensive had it all: dogfighting aircraft, ground combat, naval surface action, naval bombardment, bombing, machine guns, artillery, river monitors and gunboats, unpredictable river currents, water levels, sandbars, floating mines sent down by the Reds, foul weather, balloons. The offensive lasted four days. One part went extraodinarily well-another part nosedived into hell-both sides get to enjoy this game! Game scale is 750 yds a hex, turns are 12 hrs, 10 in all. Ground units are platoons, artillery batteries, single aircraft include: sopwith, Spad, Avro, DH9A, Re 8, Neuiport, M20 and Short. River ships include: monitors, gunboats, each representing one ship. Ground units include Lewis guns, MG, Stokes mortars, leaders, infantry. There are two game maps, one covers the ground action and the other the air to air combat at a different scale (50 yd a hex). Aircraft are rated for speed, bombing, size, maneuver, altitude. 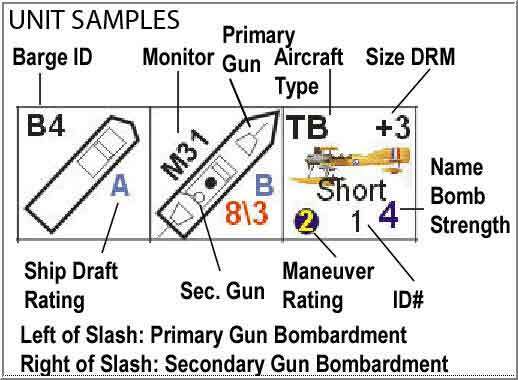 Thus, the game is really two games: an opertaional ground game, a tactical naval and air to air combat game! Paul Kantro 9 9 9 Interesting combination of air, land, and sea unit. I do wish the board came in 2 8.5 x 11 pieces. Mike Dundas 10 10 10 Yet another excellent Perry Moore game !